New for March 2007! Everyone knows that you can get good isolation from a properly designed Wilkinson from port 2 to port 3. Ideally the isolation is infinite at the center frequency (if you have an odd number of sections)! But you must also understand that this isolation is a function of the impedance match that the common port sees. An ideal 50 ohm Wilkinson only has perfect isolation when the ports are all perfectly terminated in 50 ohms. Let's look at an example, where the common port sees a 1.5:1 VSWR. In the Agilent ADS model below, this is provided by terminating port 1 with 75 ohms while the other ports are terminated in the proper 50 ohms. You can use our VSWR calculator to see that 1.5:1 VSWR is equivalent to -13.98 dB return loss. Now let's look at the response. 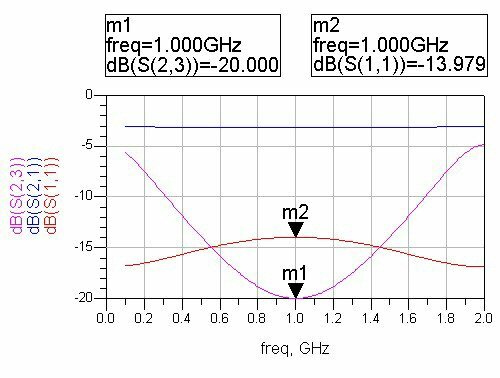 The isolation S23 is exactly -20 dB at the center frequency, while the output match is also degraded to about -13.98 dB. It turns out that -13.98 dB is equal to the equaivalent return loss of 1.5:1 VSWR that appears on the input port, so this mismatch appears in all its glory at the split ports! The center frequency isolation is 6.02 dB worse than the return loss at the common port, and you can verify yourself that this happens regardless of what VSWR you place on the common port. So don't go design a Wilkinson for 20 dB isolation and place it after an amplifier that has a 2:1 output match, you'll get around 16 dB isolation! Time for two Microwaves101 rules of thumb! 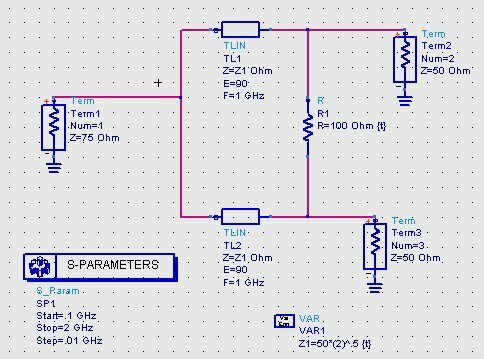 Read this page to gain an understanding of how much the Wilkinson resistor needs to dissipate. It only sees RF when RF signals that are being power-combined become out of balance.